The ultimate guide to global marketing events. If you would like to add your event to this listing page please get in touch! We have a number of promotional packages to suit all budgets. Our packages include listing your event in our event directory, promotion on our weekly Insight newsletter, banner advertising around the GMA site and editorial coverage. The event will discuss the latest developments of the GDPR as well as what has been learnt from the first 12 months from UK business as-a-whole and the ICO commentary. We are focusing in more detail on the common pitfalls, plugging the gaps and creating a defendable position should you breach. There will also be sessions providing the latest views on ePrivacy regulation and the most up to date information on staying compliant but effective with marketing. This should appeal not only to those who manage data protection/privacy programmes but also to those who are members of a data steering board/forum, C-suite and other senior managers who manage teams which are responsible for processing personal data – such as heads of Marketing, Sales, CRM , HR, Finance or other Operational functions. Create your data strategy roadmap and harness your organisations data as a strategic asset for driving business value. Is your organisation or department experiencing the effects of a poor Data Strategy? 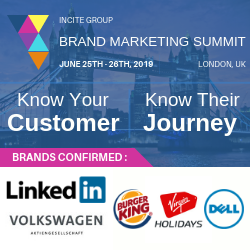 The Most Senior Brand-Focused Marketing, Digital and Social Media Summit comes to Europe! Technology for Marketing is the UK’s only event dedicated to martech. One spot for marketers to nurture their next big Idea. One place to gather actionable inspiration from marketing gurus who’ll share their glimpse of the future. Festival of Marketing is brought to you by Econsultancy, Marketing Week, Creative Review, Design Week, Marketmakers and Oystercatchers part of Centaur’s Marketing and Creative portfolio. The Cyber Security Summit is the UK’s only one-day cyber and data protection event supported by HM Government, National Cyber Security Centre and National Crime Agency.